Jasper is one crazy booth. Built into a 1970’s classic Mini Cooper car , not the modern B.M.W. imposter. Jasper is a photo booth with a huge dose of added fun, perfect for the snapchat generation. Capable of taking 5-6 guests. It is themed around the classic Michael Caine film, the Italian Job. Decorated in the same style with 3 driving lights, bonnet straps and italian job themed music from the computer control system. This is one great little photo booth. Do you really want a booth in a square box when you can have this? An icon of cool Britannia, the Mini is one of those dream classic cars that screams its quirky Britishness from the rooftops. •Box Of Fun Funky Props. •Guest Book And Additional Prints. Our booths utilise start of the art technology. Including high speed dye sublimation printers, Canon DSLR cameras, and integrated touch screen computers. They provide a fully automated intuitive photography system. Our wireless social media tablets provides a seamless way to spread the photo love. Via various social media, with instant uploads to Facebook, Twitter and Instagram. The mini coopers styling is great for any event, from a wedding reception to a corporate sales promotion. 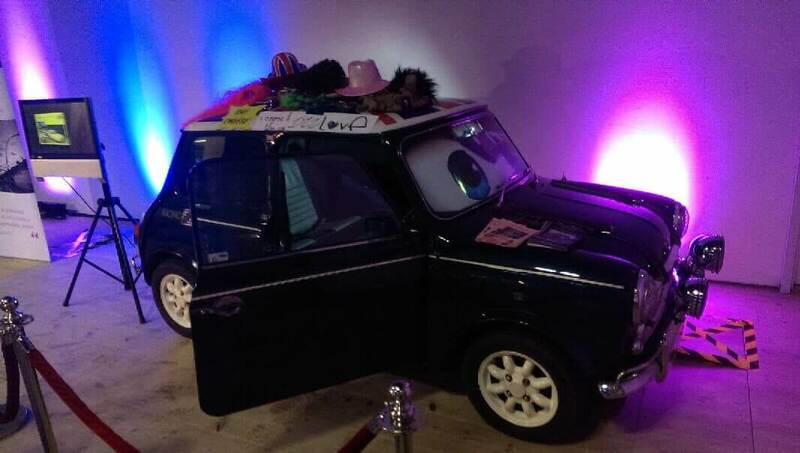 We can work with you to customise any facet of the mini cooper booth. Whether its adding your company branding to the outside, or creating a custom interior to fit in with a social media campaign. •Social Media Tablet To Share Prints. “You were conceived in the back of one of these son”. Mother of the groom at a wedding. Use our wireless social media tablets to offer instant uploads to Facebook, Twitter, Instagram or your guests email address. Great for weddings, perfect for spreading brand awareness at a corporate event. Our Mini Cooper photo booth comes super cool as standard, but we are more than happy to work with you to customise it to meet your precise requirements. Whether its simply adding ribbons to the exterior for a wedding, or totally revamping the interior for a photoshoot we can do that, many corporate clients brand the outside for sales promotions or exhibitions. Our Mini Cooper photo booth comes super cool as standard, but we are more than happy to work with you to customise it to meet your precise requirements. The royal family, warm beer, tea, there are many things which are quintessentially British, and the classic Mini Cooper is one of them, designed by Sir Alec Issigonis in 1959 , this little car has more character and grabs more attention than many high end sports cars of today, add a touch of fun to your event with a super cool booth. Designed by Sir Alec Issigonis in 1959, the Mini was BMC’s answer to the Italian’s Fiat 500 and the German bubble cars. These small cars were becoming increasingly popular due to the fuel shortage caused by the Suez crisis. The first version of the Mini was demonstrated to the press in April 1959, with them being made available to the public on 26th August. They were sold in various guises such as the Wolseley Hornet, the Riley Elf, Austin Seven, but were known throughout the world as “The Mini”. A mainstay of 1960’s culture, the Mini became a performance superstar, when John Cooper the owner of the Cooper Car Company, increased the power of the Mini engine to create first the Mini Cooper, then the even hotter Mini Cooper S, famously starring in the Italian Job movie with Sir Michael Caine. Our classic Mini Cooper photobooths for hire throughout the full U.K. and Europe. Including Yorkshire, Lancashire, Scotland, The North East, London and The Midlands. The mini is a perfect booth for weddings, parties, corporate events, exhibitions, promotions, military functions, company fundays.